As winter brings harsh weather, you may need dry ice as a helpful resource in your home. In the midst of a snowstorm, probably the last thing on your mind is bringing more ice to your home. However, ironically with the many uses of dry ice, it can be very helpful in many scenarios. As winter brings harsh weather, you may need dry ice as a helpful resource in your home. Here’s how dry ice has many uses for winter snowstorms. Just like in the summer, snowstorms in the winter bring high winds and rain. However, in the winter, you also have to deal with ice that causes power lines to freeze, tree branches to freeze and break, and pipes to freeze and burst. Any of these factors alone will cause a power outage but a combination could leave your home without power for many days. In this scenario, dry ice will keep your perishable food cold for a long period of time. Simply add a block of dry ice to the bottom and top of your freeze, respectively. 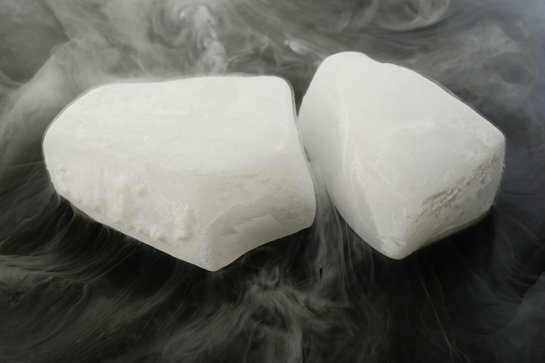 Unlike ice made from water, dry ice won’t melt into a puddle and will stay colder, longer as it sublimates. This method is also important for people that take medicines that need to be kept cold. Just like in the summer and other applications, you must always remember the safety rules of handling dry ice. Remember to take the necessary precautions to keep dry ice off the skin. Ensure that it is stored in a safe place, away from small children. Because dry ice sublimates, it requires a good amount of ventilation. In airtight containers or environments, there is a risk of pressure building from the gas, which could cause a dangerous explosion from the container that it’s being held in. Avoid direct contact of the dry ice to your food and other frozen items. Use a towel or paper to create a barrier between the dry ice and your frozen items. This entry was posted on Friday, December 15th, 2017	at 2:31 PM	and is filed under Many Uses of Dry Ice	. You can follow any responses to this entry through the RSS 2.0	feed. Both comments and pings are currently closed.